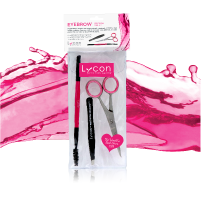 LYCON’s Eyebrow Precision Tool Kit is your handy sidekick when it comes to creating your client’s ideal brows every time. Perfectly weighted, sharp scissors, black precision tweezers and our famous pink dual ended angled brush and spoolie work harmoniously together. When paired with our LYCOJET Eyebrow Hot Wax and Lycocil Tinting collection the Eyebrow Precision Tool Kit provides brow artists the confidence needed to deliver outstanding results.